If you think of Mekong Delta Vietnam you could not help thinking about yellow rice farms and maze of canals. 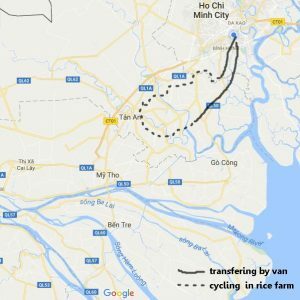 This Mekong bike one day to rice farm trip is to touch that beauty on a bicycle that you will receive full feeling about Vietnam. 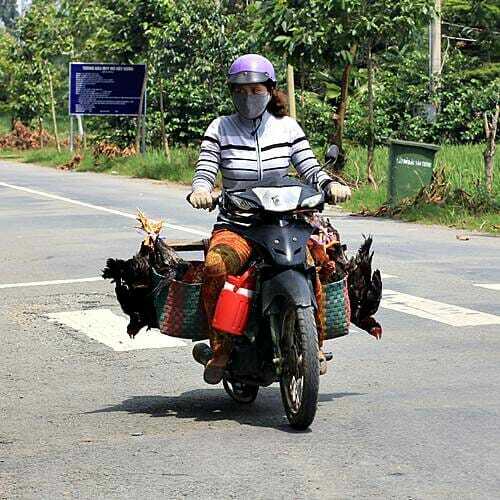 Of course you also cycle passby fruit gardens, duck farms, fish farms and other amazing stuffs. Total length of cycling is around 60km on the very flat dirt, semipaved, paved and small cement roads. However, you can revise the length of the cycling routes so as to match your own preference. A good mountain bike will bring full safety on the bike. Don’t worry about your different targets of day cycling as compared to other members, because we always have back up van at big roads nearby and this helps you to feel confident with any cycling capability in your day target. Take a lift by bus around 60 minutes to get out of the crowd of 10 millions motorbikes in Saigon. 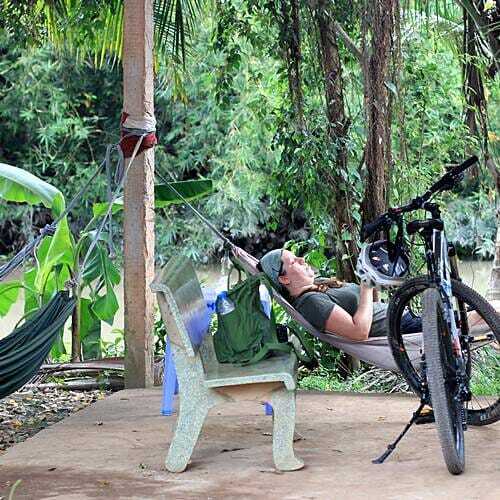 Put on your gear and start to cycle into the rice farm in the cool fresh air of the Mekong morning. Take the small roads passing by villages with poor houses, bike further to Mekong Delta across rice fields, dragon fruit plantations, and corssing the rivers by ferries like local people. The experience of passing the river with local people on a local fairy should be great with conversation with student girls, old farmers or local merchandisers. We also visit some pagoda en routes. 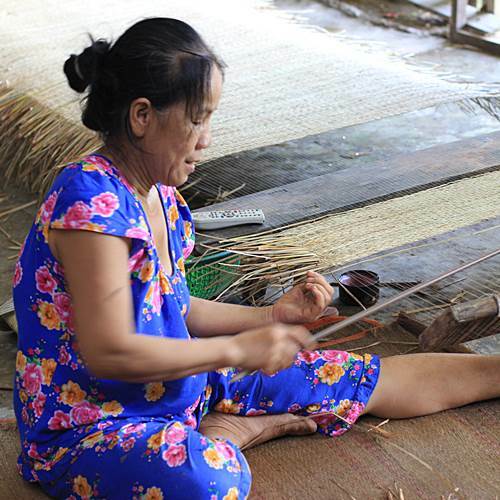 In the afternoon, after a lunch in a local noodle shop, we visit some local families where they make incense sticks, sleeping mats. 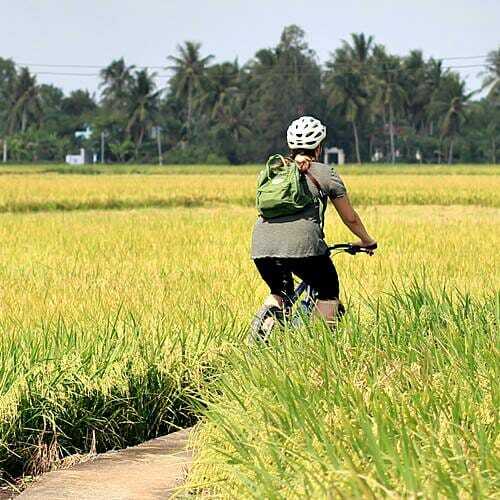 Then continue the cycle to more rice farms where we can discover cool local house for a cold drink, or more activities on the rice farms. 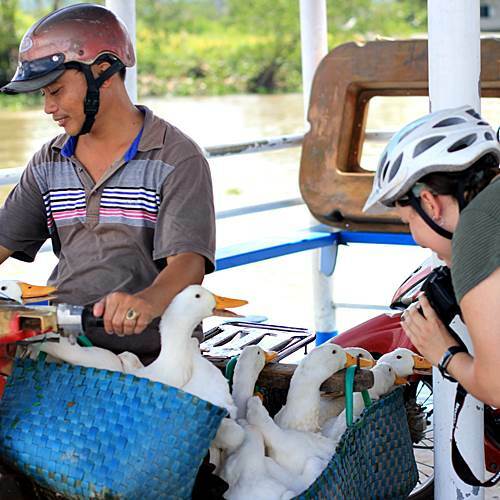 The cycling continues after some breaks, and we also cycle to duck farms and fish farms where the real life of Vietnamese peasants exposured. In the end, we take the transfering van back to Saigon. End the Mekong bike one day in Saigon. © Copyright - MeKong Trails Travel - Personalized tours in Vietnam, Laos and Cambodia. All rights reserved.